Farmhouse-style bedroom suite in a sophisticated black finish includes king poster bed with USB charging, mirror and 6-drawer dresser. Glamorous suite includes upholstered queen storage bed, mirror and 9-drawer dresser, each flaunting stunning curves in a metallic finish. 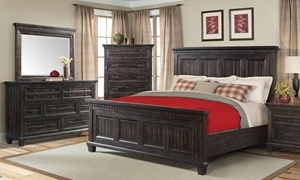 Polished full bedroom suite features sleigh storage bed with roomy footboard drawer, plus dresser and mirror in a matching cherry finish. Sophisticated king bed, dresser and mirror crafted from solid acacia in a grey oak finish feature thick dentil moldings and hidden storage. 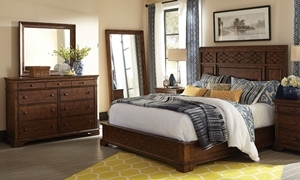 King bedroom suite features a stately headboard with detailed trim, matching 9-drawer dresser and landscape mirror in a coffee finish. Elegant king sleigh bed with upholstered headboard panels accompanied by matching 10-drawer dresser and landscape mirror. Classic sleigh bedroom in a cool gray finish features queen bed with built-in USB ports, 6-drawer dresser and matching landscape mirror. Classic sleigh bedroom in a cool gray finish features king bed with built-in USB ports, 6-drawer dresser and matching landscape mirror. King panel bed with USB ports, matching dresser with six full-extension drawers and landscape mirror in a modern gray finish. Queen panel bed with USB ports, matching dresser with six full-extension drawers and landscape mirror in a modern gray finish. 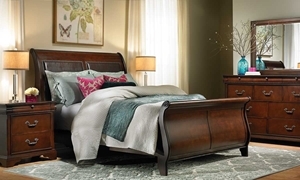 Classic sleigh bedroom in a warm brown finish features queen bed with built-in USB ports, 6-drawer dresser and matching landscape mirror. 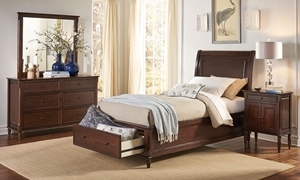 Classic sleigh bedroom in a warm brown finish features king bed with built-in USB ports, 6-drawer dresser and matching landscape mirror.